Today is Muffin Tin Monday again. We went for our big egg again and a side cup with chick feet. 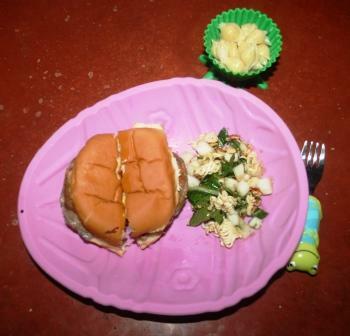 Pierce had a turkey burger with pickles and mustard, a side cup of garlic pasta shells, and a side of bok choy salad. Bok choy salad, if you've never had it, is so yummy. You can find the recipe HERE - it's wonderful to take to barbecues and cookouts. For more muffin tin Monday ideas, head on over to Muffin Tin Mom. Hope you are having a nice long weeekend with your family, Lisa. I side dish in chicken feet sounds wonderful! This lunch looks yummy! I am going to have to try that Bok Choy salad! Sounds good! Enjoy the day..
Bok choy salad does look yummy! I will have to try it. I'm so far behind in reading my favorite blogs I'm not sure I'll ever catch up. I have never had Bok Choy..but it looks very good.. Something that I could try on my next potluck at church. I love Muffin Tin Monday.. You make food always to look good..~! I LOVE your muffin tin posts, and you have given me so many ideas! As soon as I'm well enough to leave the house, I'm going to Target and getting three silicone muffin pans, for us and the girls!! It's on my list. I'm hoping that Ella will eat more this way, she is underweight. I sent Phil down to the bookstore yesterday and we got The Pout Pout Fish! It is very cool, and now I have both of those fish books and only need a bag of shells to do the sea craft. I am so excited about healing and getting the girls back and doing all your ideas!! When I meet you, I wouldn't be surprised if you are Superwoman and have a cape!!! I don't know how you do all this and run a farm! And of course I would just LOVE to meet you!! It is such fun to meet bloggers, I have done that three times now. I am still laid up for a few weeks, but am hoping to be better soon, and will really look forward to this!! Would you believe we have only been to The Green Valley Book Fair once? But I love o go for the kids books. I love bok choy. Will check it out. A nice lunch. I have the chick feet muffin cases and they make my youngest chuckle everytime I use them. It looks delicious. I love the purple egg plate. I like turkey burgers also! Cute egg plate and chick muffin cup!! And it's great your child will eat Bok choy salad! Sounds yummy.